He spent the beginning of the year under the warm sun during a romantic holiday with his mysterious girlfriend in Cabo San Lucas Mexico. 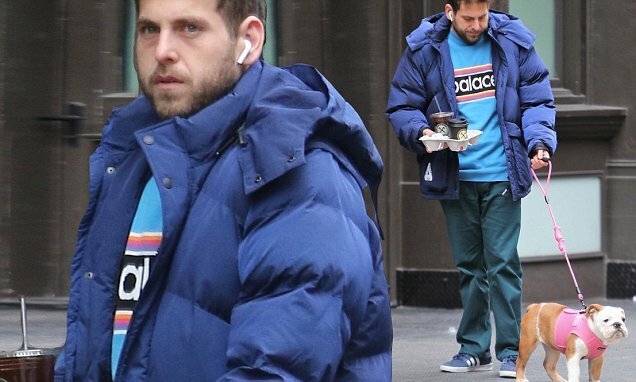 But Jonah Hill bundled up in a heavy winter coat as he stepped out for a breath of fresh air in New York on Monday afternoon. The 34-year-old actor seemed to be in great spirits as he picked up a few coffees with a little English Bulldog walking by his side. The Superbad actor looked cozy wearing a massive puffy blue coat as he walked the little dog on a pink leash. He sported an electric blue T-shirt underneath is warm jacket, with black-and-white writing outlined in vibrant stripes. Jonah covered his legs with dark green pants and wore a pair of navy blue Adidas sneakers featuring the brand's signature three bright white stripes along the side. You Can Now Build Boeing's Starliner Capsule With Cobi Toy Blocks With work underway to return astronauts to space from U.S. The Way Tommy Lee and Brittany Furlan Met Is Totally Bizarre, but Also Kinda Cute? trackOutboundLink('article:page', 'www.